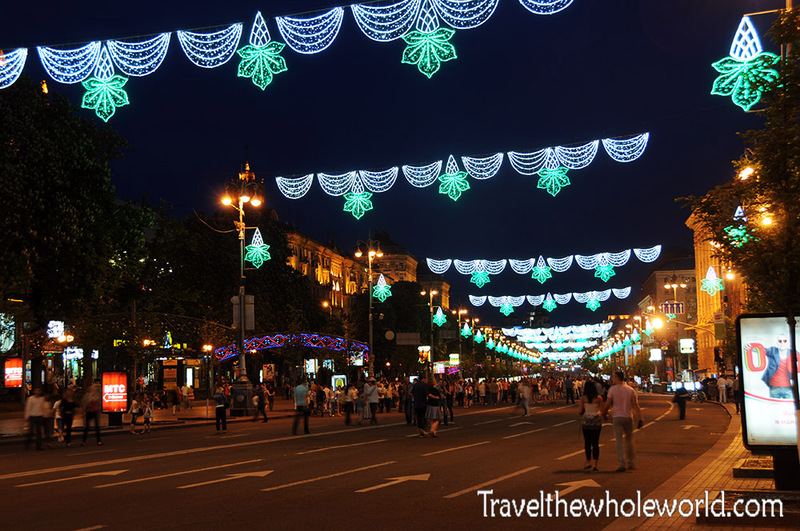 The capital of Ukraine is the city Kiev, located in the north central part of the country. Its population is approaching three million people, and most of them live in high rise buildings found all over the city. 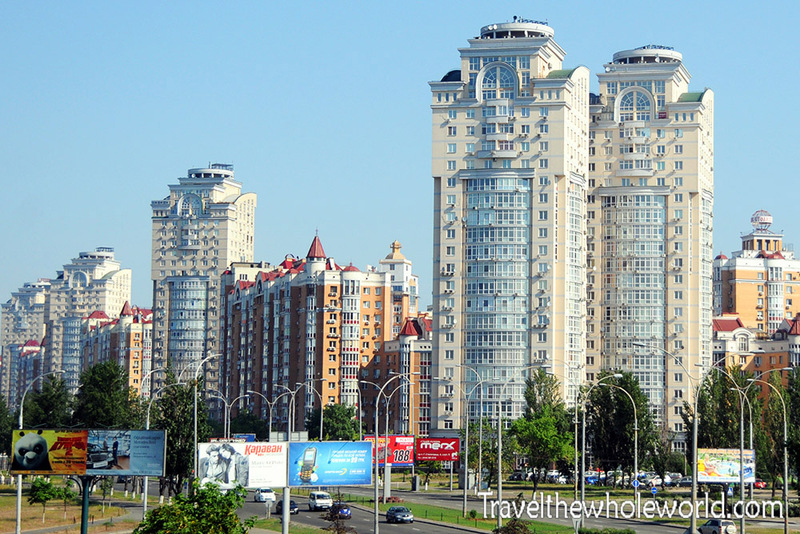 Kiev is a much bigger city that I imagined, and is split up by multiple districts. Of these I only visited a few, so despite all my pictures here they only represent a tiny part of Kiev! 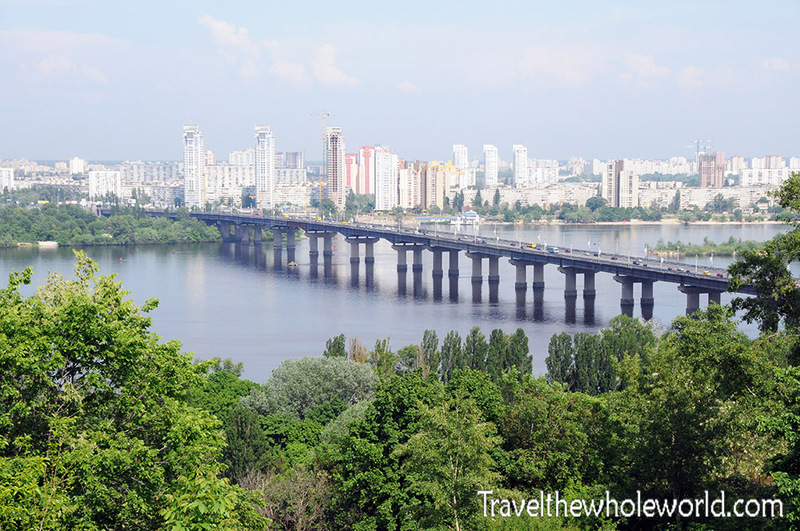 Most of the interesting places for travelers are of course in the city center in the western side of the Dnieper river. These areas that I didn’t explore seemed to be made up of sprawling residential areas, likely for the working class. 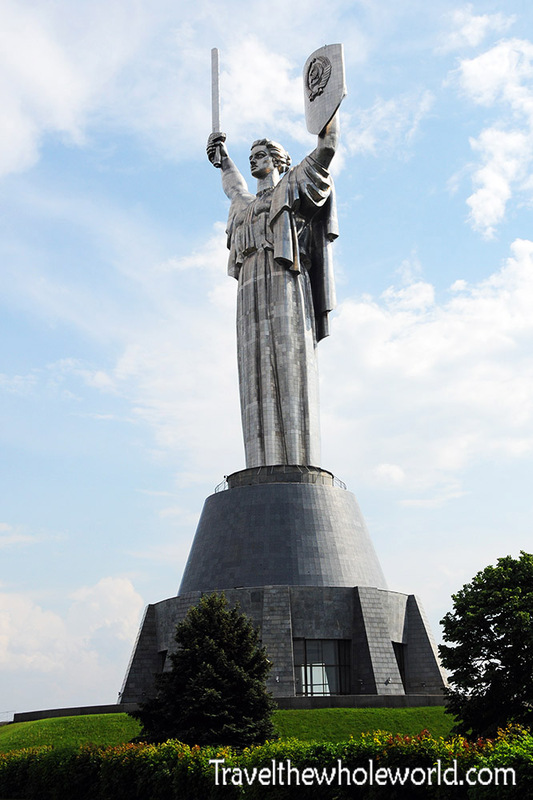 I came to Kiev without knowing too much about the city, but I had been aware of this giant statue of Mother Russia for a long time. I figured this was a good place to start exploring the city, so I started my travels here in front of the nearly 200 feet (60 meters) tall statue. This whole area is part of the WWII, or Great Patriotic War Museum as many former Soviet countries often call it. If you notice the tip of the sword has been cut, and the reason for this was to keep it lower than the Pechersk Lavra cathedral’s tower. 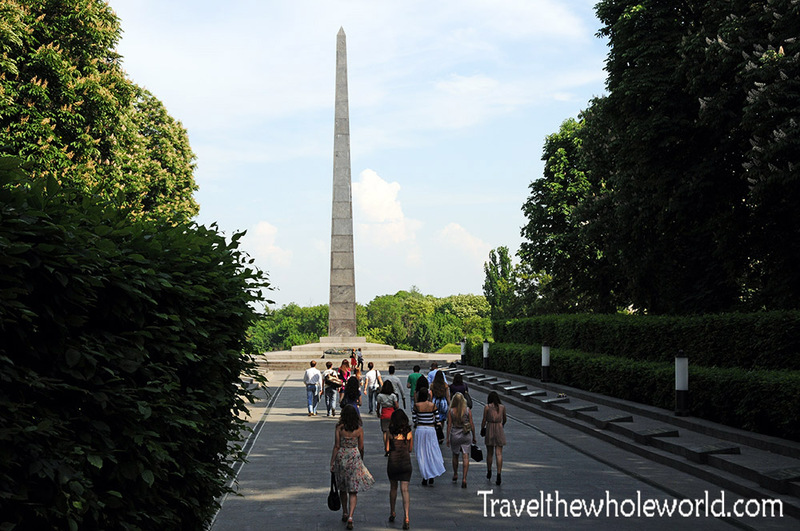 Immediately by the Mother Russia statue is the Park of Glory monument and an eternal flame dedicated to Soviet troops in World War II. In the photo above you can see the monument and maybe barely make out the eternal flame at the base, but this park is actually much larger than what you see and seemed to go on forever. It was full of people enjoying the nice spring weather, and even had a few food and ice cream stands spread about. I know about a year before my visit a woman was arrested here for cooking hot dogs and eggs over the eternal flame, claiming it was nothing more than a Soviet propaganda site. I think everyone would agree that the Nazis were evil, and since the memorial honors those that died fighting them it looks like I’m going to side with the Soviets on this issue! 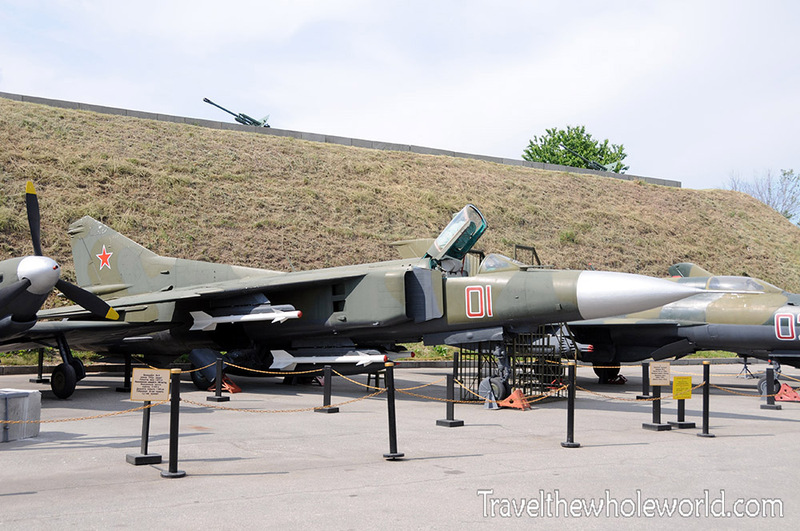 One thing that I missed out here was visiting their military history museum. It was closed by the time I got there on Sunday, and was closed all day on Mondays and so I never ended up visiting. I just missed them closing by about 20 minutes, so I was able to peak inside and at least take the photo above since they hadn’t locked the front doors yet. 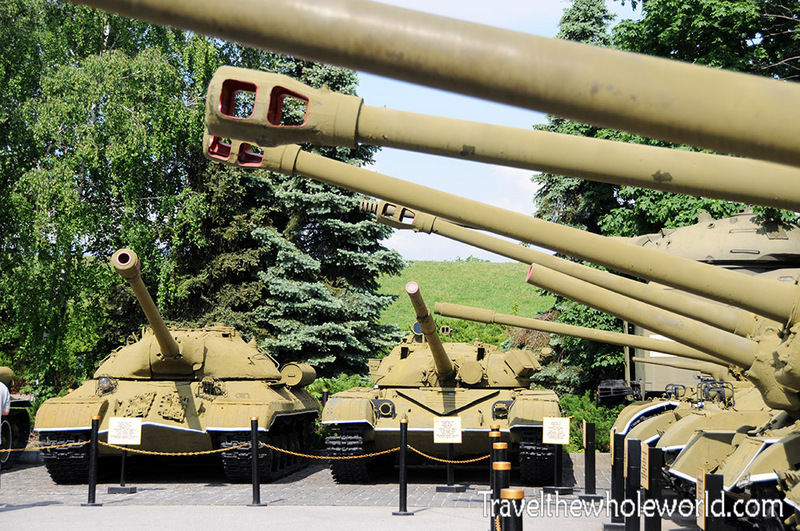 Luckily for me they have a large outdoor museum that is always open, such as these World War II tanks photographed below. These two photos above and below show some other parts of the outdoor museum. 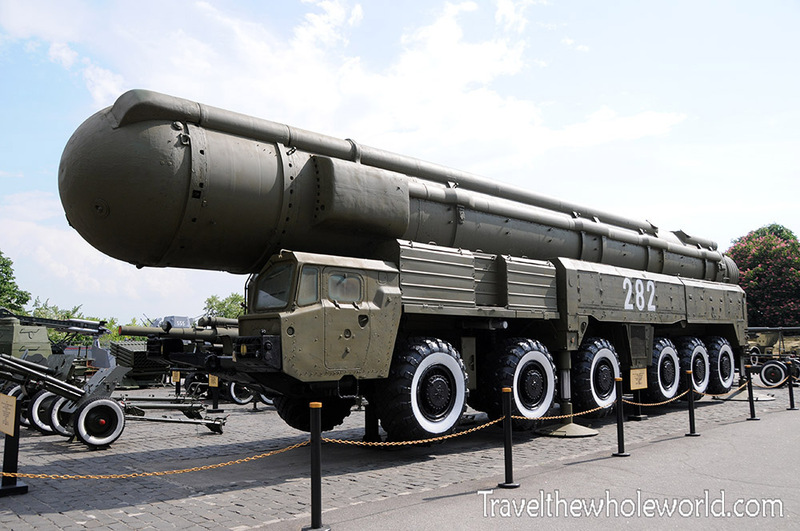 The military park had an impressive collection of dozens of tanks, aircraft including a Mig, other types vehicles and artillery, and even an ICBM launcher! 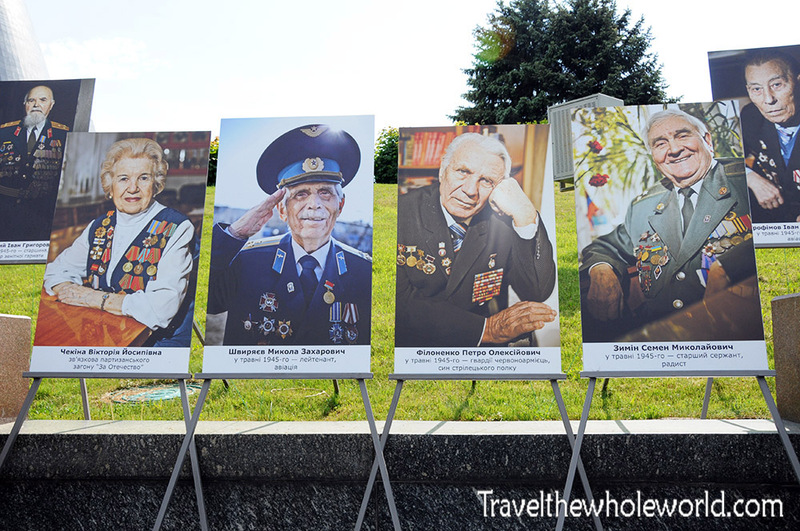 Lastly in Glory Park close to the Rodina Mat statue were these military portraits. 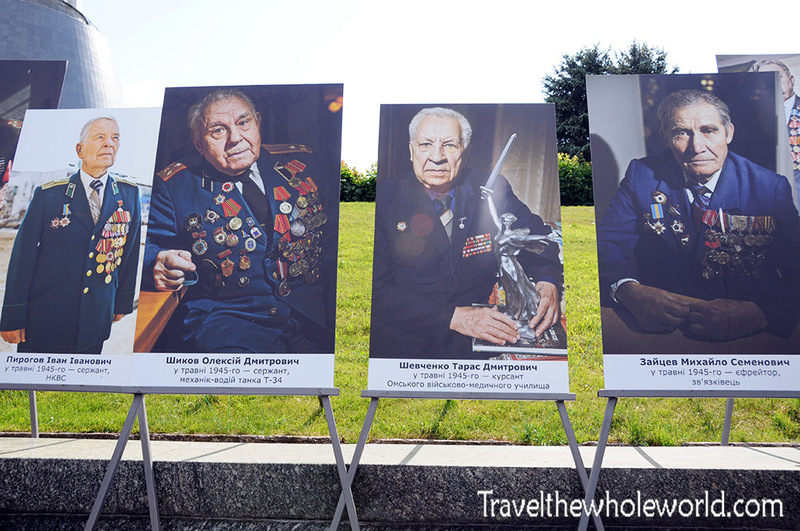 Both sides of the statue are lined with these leaders who clearly served during World War II. There weren’t any English translations available, so other than dates on their portraits I’m unsure of any details. These almost seemed like maybe they weren’t permanent exhibits, and were on display the weekend I happened to visit. After leaving Glory Park, I came across the most interesting and important memorial in the entire country. 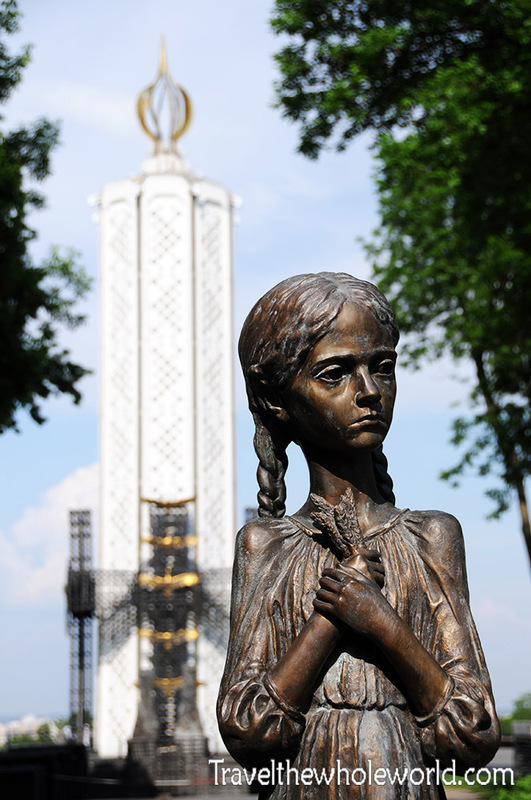 This memorial is dedicated to the great famine known here as the Ukrainian holocaust, or locally the Holodomor. I’ll admit that this was something I had never even heard of until I visited Ukraine. The Holodomor happened in the 1930’s when Ukraine was part of the Soviet Union, and was hit by a famine which killed an unprecedented amount of people. Between two and four million people lost their lives, and some even claim that the numbers reached as high as eight million. The greatest tragedy about the Holodomor is that this wasn’t created by forces of nature such as a drought or natural disaster, but instead was man made. Most experts agree that the famine was a direct result on the economic policies of the Soviet Union, and some go as far as to say it was an intentional way to murder Ukrainians to demoralize rising nationalism. In 2006 the Ukraine government passed a law officially declaring the Holodomor as genocide, and denying this is now a criminal act. 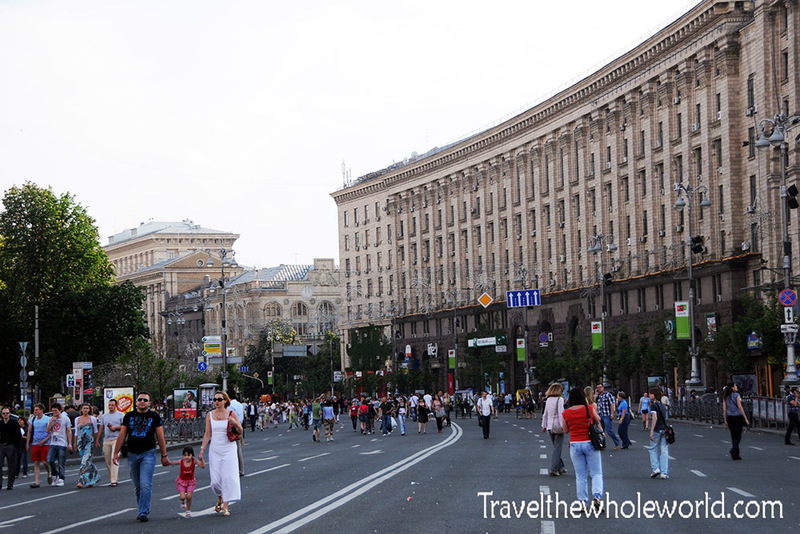 After I left the Holodomor memorial I traveled to downtown Kiev wanting to visit Independence Square. 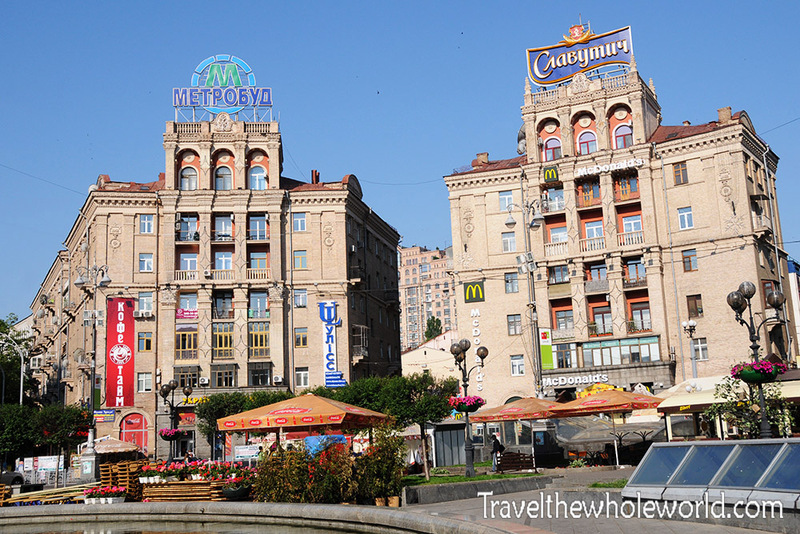 Kiev is a huge city, and Independence Square is actually pretty far from Glory Park. This photo above shows a random picture elsewhere in the city. I’m sharing here because it’s actually nothing more than a subway station! I used the subway mostly to get around Kiev since it was so cheap and convenient. Despite how beautiful the station was, the train that arrived was on the opposite side of the attractiveness scale. I only used the subway a few times, and for the most part I walked nearly everywhere I went, even if it took a few hours. The great thing about walking around Kiev was I never had any shortage of small stores and cafes to support my urban hiking. 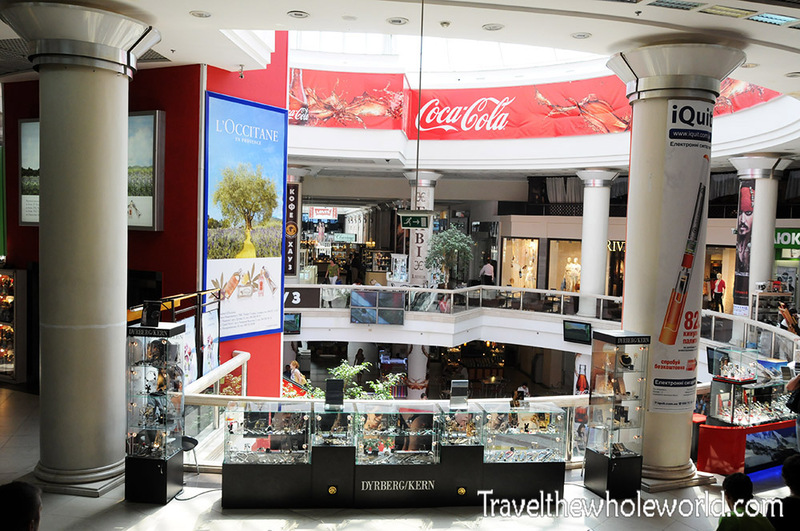 This indoor mall was near the city center, while the coffee shop below was in a random neighborhood I passed through. 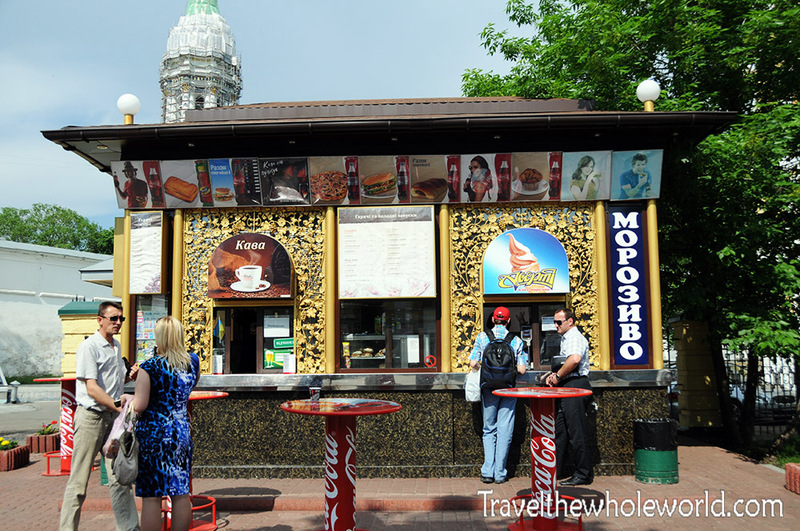 There’s no shortage of coffee and tea in Kiev, and during the spring and summer, you’ll also never have a problem finding ice cream. 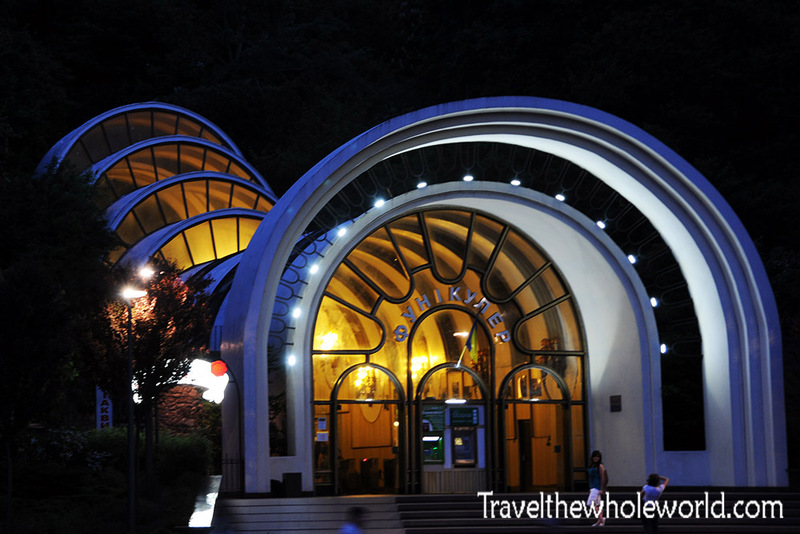 Like many nations that fought in World War II, Ukraine has an Arch on Triumph in the heart of the city. To be honest, it actually felt quite small, but that may have been because I was comparing it to the last Arch of Triumph I came across in North Korea! 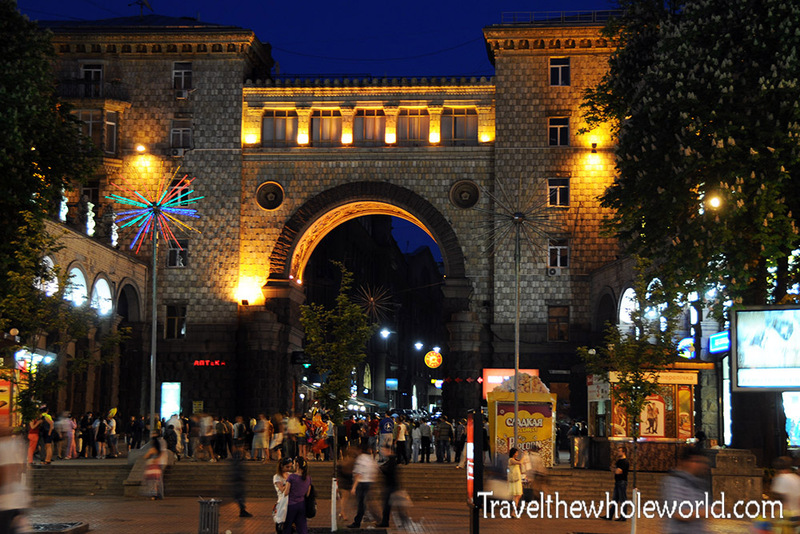 The Arch on Triumph leads into Independence Square or Maidan Nezalezhnosti in Ukrainian. The square was the meeting place for my trip to Chernobyl, and since my hostel was around the corner I found myself walking through here almost daily. There were always a lot of vendors here who mostly seemed to be selling T-shirts. I found it impressive that there was a stand selling alcohol at eight in the morning. Even more impressive was the fact there were people in line! I regret not getting more photos of people on this trip, but that’s always something that can be complicated overseas. This was a great place for people watching, and the most entertaining experience I came across was two guys dressed up like Disney animals posing for photos with little kids. When some older teenager walked by and gave one of their tails a hard pull, the nice smiling animal head was removed revealing a red faced man full of rage. He gave the head to his companion and started to angrily shove the teenager around trying to settle his score with hand to hand combat. The teenager who pulled the tail was clearly intimidated and nervously backed out. All that entertainment was in the early morning and in the afternoon. This photo above shows Center Street which passes by Independence Square. You can see how lively it is during the day, but I found at night the place was even better to visit. There always seems to be something going on here, and one example is when I had missed visiting on a Saturday night because I was somewhere else in Kiev. The taxi I took that was driving me back pointed out the fireworks in the sky, explaining that there are often large festivals going on there each weekend. I was definitely disappointed that I missed it, but even on a Sunday night there was lots to do with live music, street performers and plenty of activities going on. If you don’t mind spending a bit of extra money, there are also lots of fancy restaurants and bars in the area. These are two other photos I took while walking down Center Street at night. Unfortunately all the photos I have of restaurants and the street performers were not worthy of posting, so you’ll have to take my word on it that there is plenty of entertainment here! In some cities the busy parts of a commercial district only extend a few blocks before completely dying ou t. That was definitely not the case here. I walked to the very end and there was never a shortage of people and busy businesses. Since I’m a budget traveler and I was solo in Kiev, I never gave any of the nice restaurants a chance, but next time I won’t miss out. Jumping back to day time in Independence Square, there is another important memorial here. This shows three brothers Kyi, Shchek and Khoryv and their sister Lybidas. An ancient historical record created in 1113 CE called the Primary Chronicles, documented Kiev’s early history. 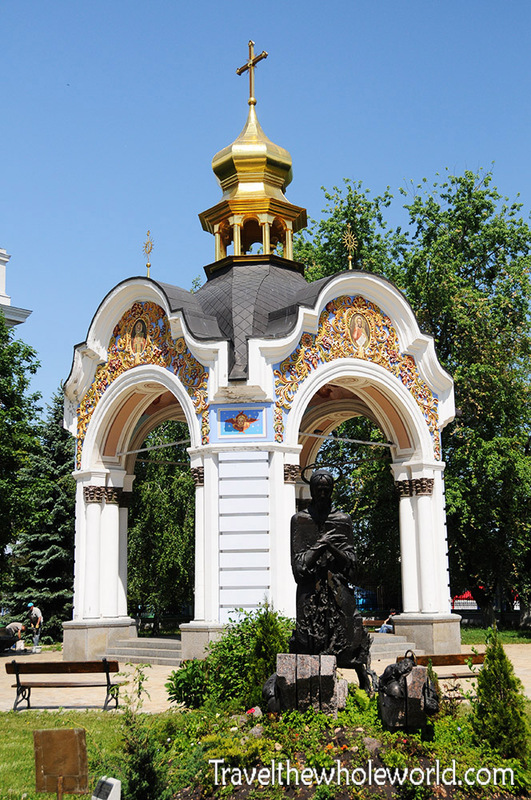 According to the Primary Chronicles, these four were said to have founded Kiev as a medieval settlement. There seems to be some debate on whether this is a true story or not, but regardless they are important figures in Ukraine and can even been seen on some currency. 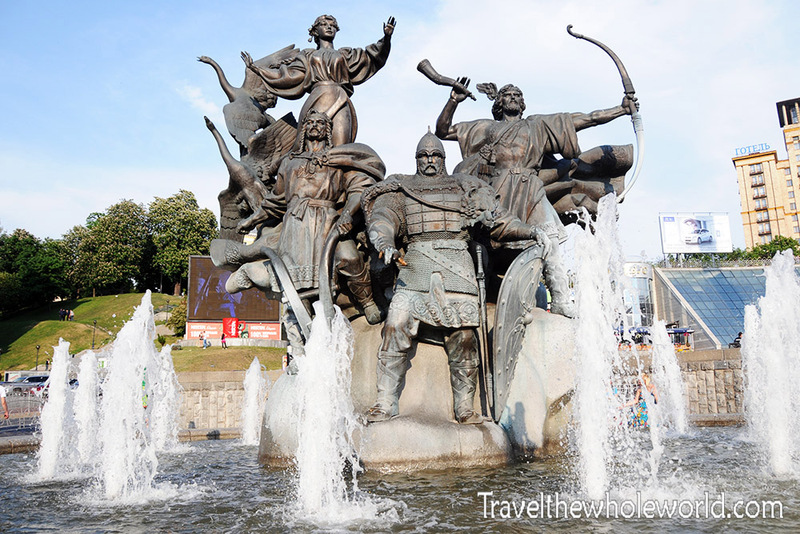 Around the mid 9th century, the vikings of all people took over Kiev and were credited with transforming it into a city. 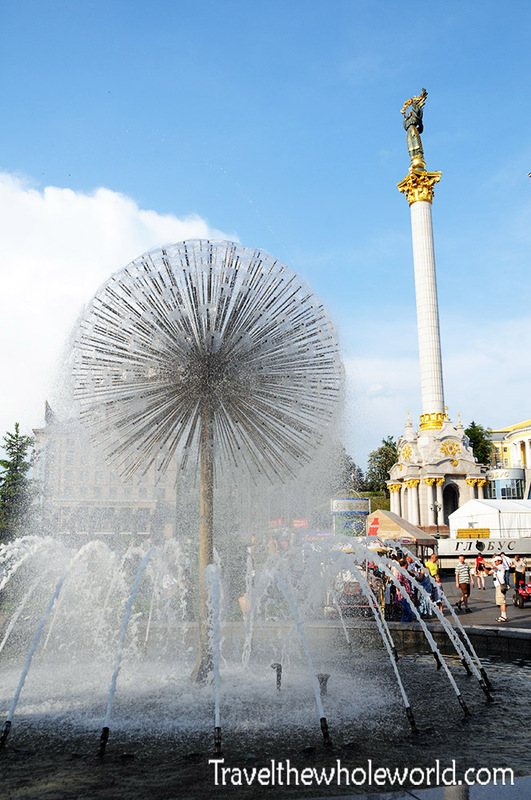 The photo above shows a large fountain in Independence Square, with a statue of Berehnyia in the background. Berehnyia is a slavic goddess who protects the homeland, or in this case looks over Ukraine. 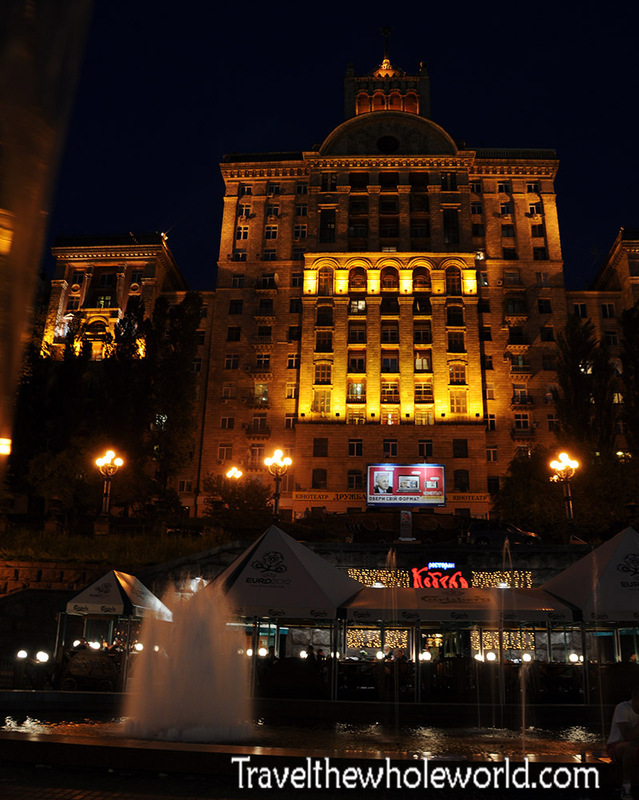 While walking around Kiev this building in the photo below got my attention for some reason. Since it’s nicely taken care of and located right outside Independence Square I figured it could be anything from an art museum to a university. I tried more than you can imagine to find out what it’s for, and five years later I was told it’s a concert hall (Thanks Alina!). 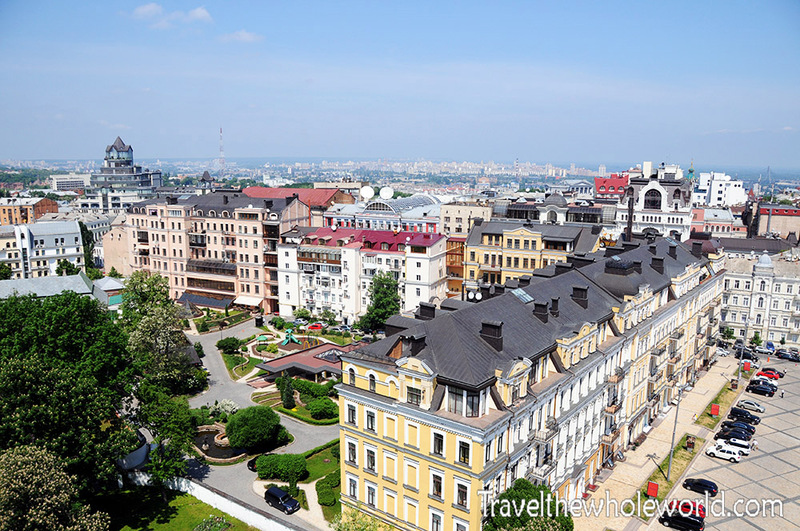 I have to emphasize that there is an endless amount of things to do in Kiev. Another historic place that is now a museum is the Golden Gate. 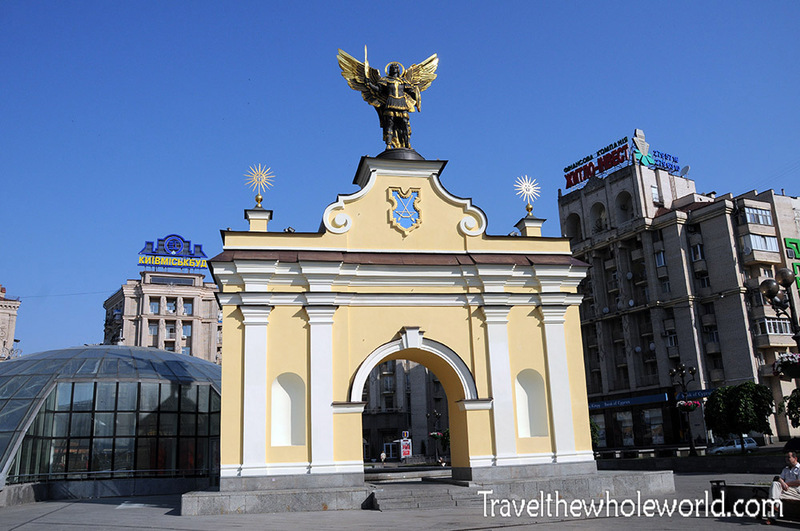 This was once the main city gate to medieval Kiev when the city was surrounded by fortifications. The gate was original built nearly exactly 1,000 years ago, but after being destroyed in the middle ages this one was built by the Soviets in 1982. Being that it’s an impressive sight now, you can image what it was like over 1,000 years ago. Built around the same time as the Golden Gate was my favorite Cathedral. 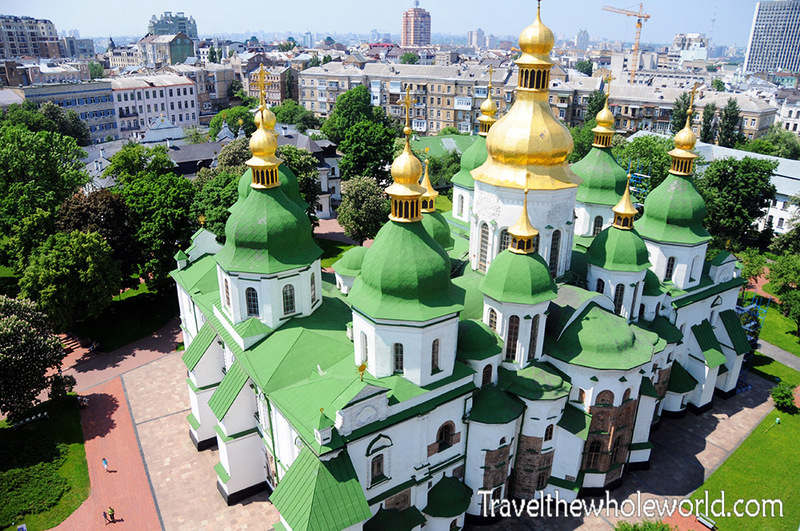 St Sophia’s cathedral is also named a world heritage landmark with its history beginning in 1037 CE. 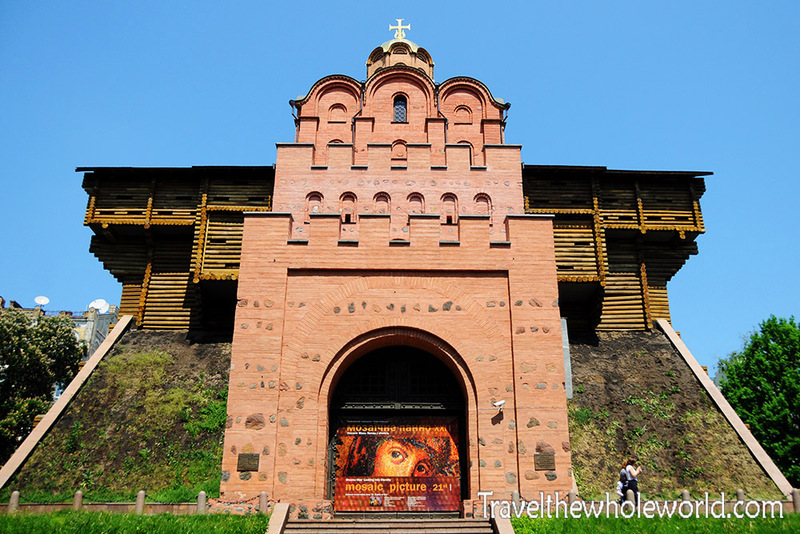 It was once a burial ground for some early rulers of medieval Kiev, which belonged to the kingdom called Kievan Rus. 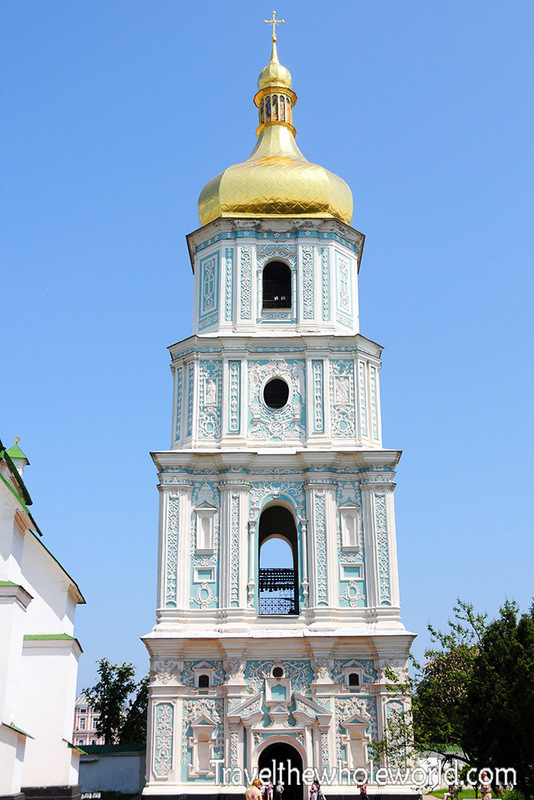 St. Sophia’s Cathedral has a beautiful bell tower as well, which you’re even allowed to climb. At the top of the bell tower I got some amazing views of Kiev as well as St. Sophia’s cathedral. 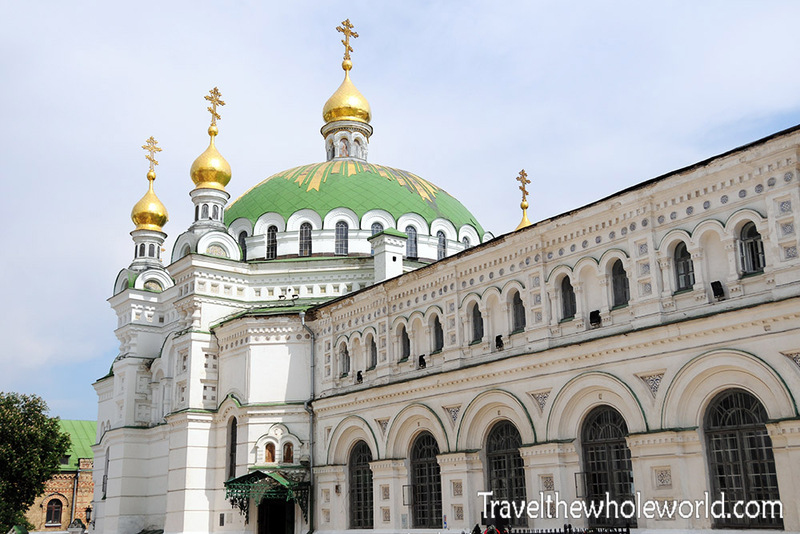 Kiev has an endless amount of cathedrals and churches, so it would be impossible for me to list them all on this page. 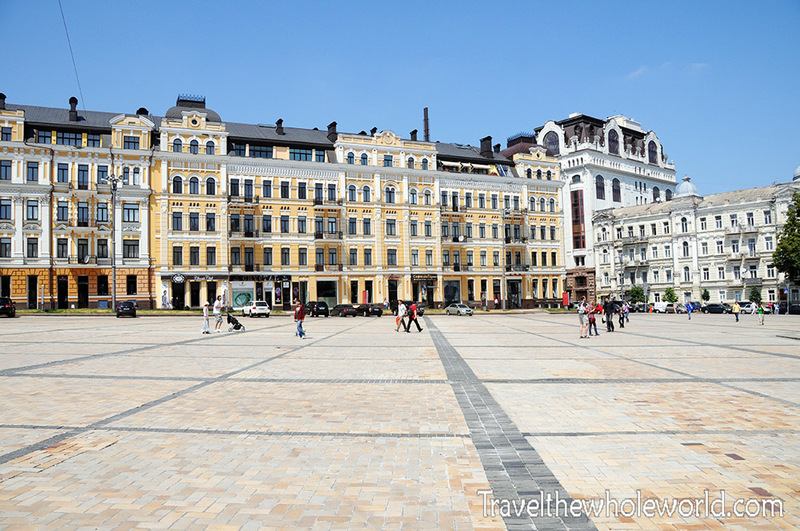 Probably the same could be said about city squares, such as Bohdan Khmelnytsky square seen above and below. The photo above was taken from St. Sophia’s Bell Tower, and the photo below when I had walked through it after leaving the cathedral. 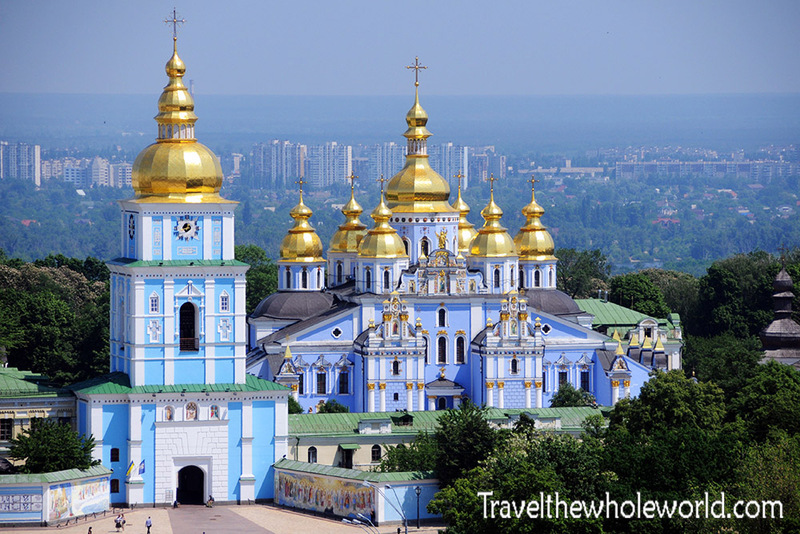 Another one of Kiev’s most famous religious sites is the Kiev Pechersk Lavra, also referred to as the Cave Monastery. Like St. Sophia and the Golden Gate, this cathedral was also founded 1,000 years ago in 1015 AD. 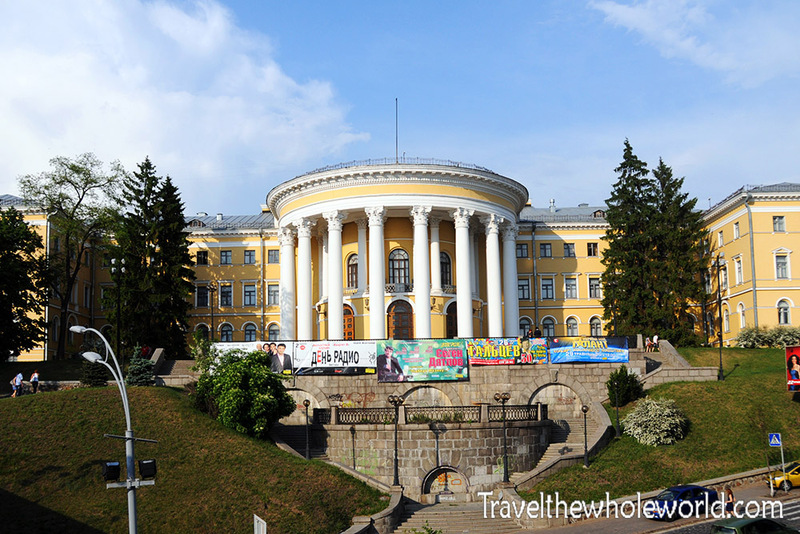 The ancient history of Kiev Pechersk Lavra and its complex underground cavern system is what make it famous today. Photographed here is the main structure in the Cave Monastery, the Cathedral of the Dormition. There’s a least two weeks worth of things I’d like to do when I revisit Kiev, but probably one of the biggest things would be to explore the underground caves. From the surface you’ll see an impressive monastery such as this photograph of the Church of the Saviour at Berestove. You’d never suspect that underground is a sprawling network of caves. My understanding is the caves are maze like, with some areas leading to living quarters, underground chapels, and even a place to store treasures. Some travelers from the 1700’s wrote that some of the caves were over 1,000 kilometers in length and even reached Moscow. Of course I find that difficult to believe, but regardless there is no denying that the cave system is complex and definitely one of the largest of its kinds in the world. 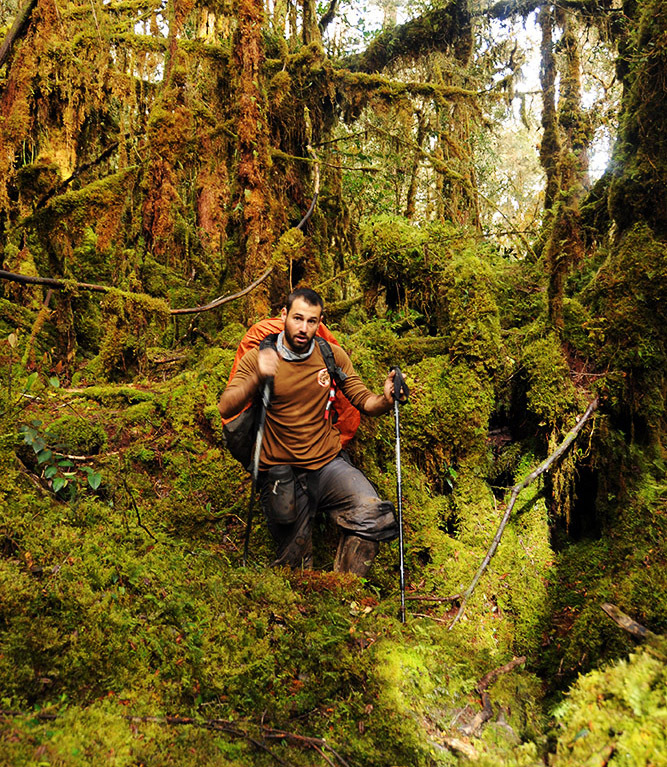 Since I didn’t go on any cave exploration I was limited to visiting places above ground. 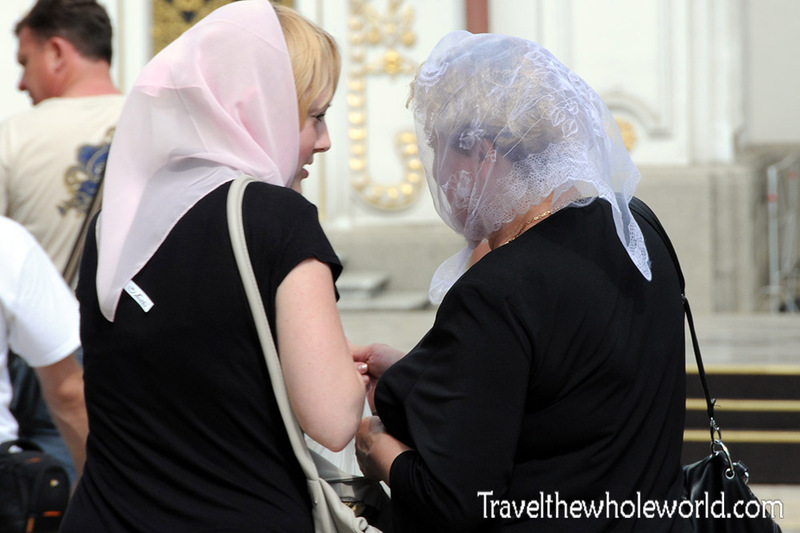 Like a church I visited in Sochi, Russia, women visiting churches in Ukraine were normally seen covering their hair. 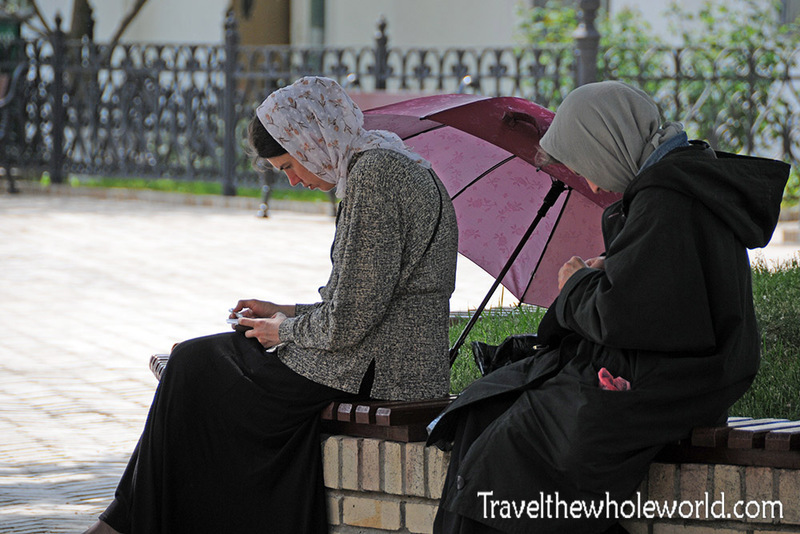 I was for some reason offended to see these two women below texting at the church, but when I passed by I found that they were actually knitting! 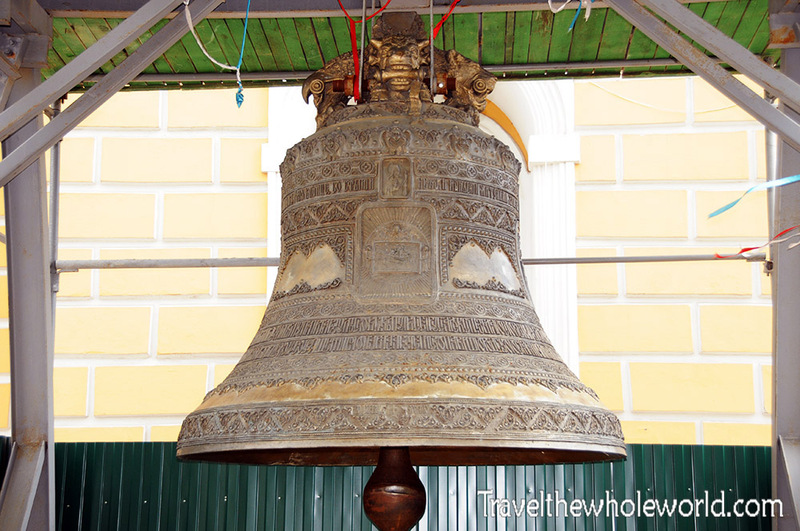 I didn’t have a guide in the monastery, so I have to assume that this bell was the cathedral’s original. They had this displayed on the ground level to be viewed. I’m also not sure if these Easter Eggs below are always on display. 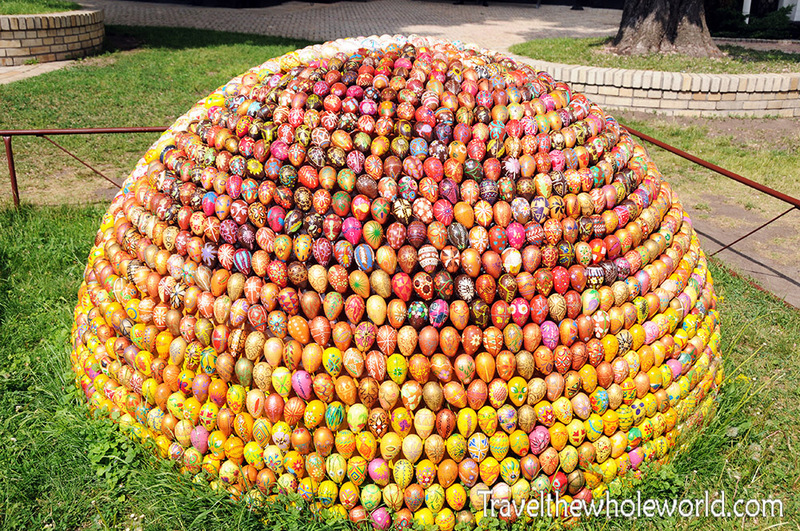 I visited Ukraine nearly a month after Easter had passed. 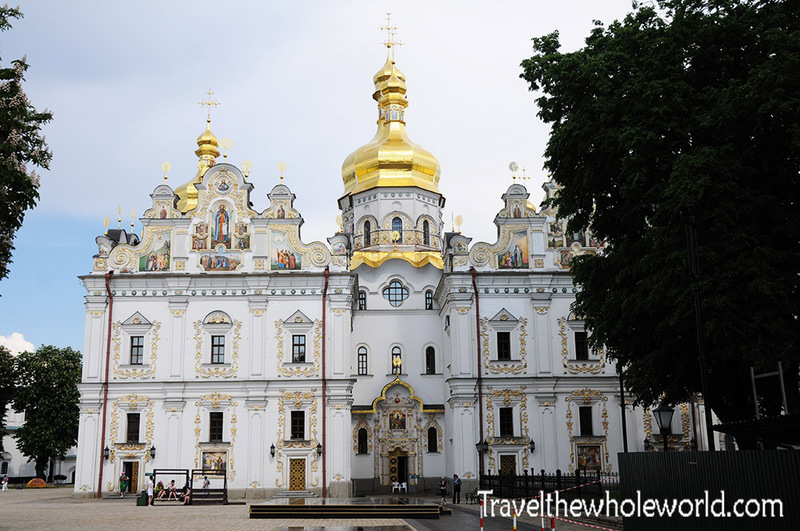 Next on my list of cathedrals and monasteries was St. Michael’s Golden-Domed Monastery. This beautiful monastery has an interesting past. It was first built in the 18th century though the history of churches and worship on these grounds goes back 1,000 years. In the 1930’s, the Soviets felt the need to destroy the monastery and replace it with their own Soviet Administrative center for the Ukraine region. Once Ukraine got independence, they immediately rebuilt the monastery back to its original design. The beautiful gazebo photographed below is from St. Michael’s Cathedral as well. Lastly I’ll share a random photo from the city. While walking around Kiev I saw this rainbow from a distanced, and hiked to it to find out what it was. When I finally made it here, I found there was a free outdoor concert, along with a reasonably large crowd. It looked like the concert had just ended, so by the time I took this photo most people had taken off. You might notice the statues in the bottom of the photo. 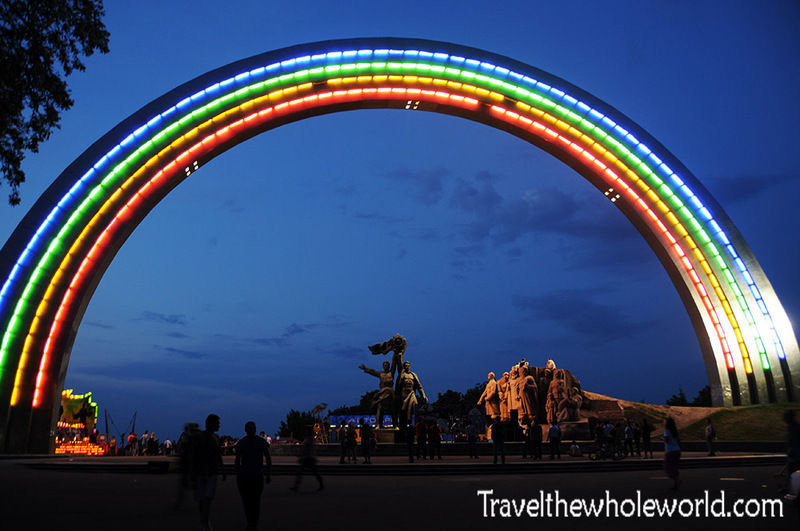 I had assumed this was a modern creation, but as it turns out the rainbow and statues were built in 1982 to celebrate the Soviet Union’s 60th year anniversary. 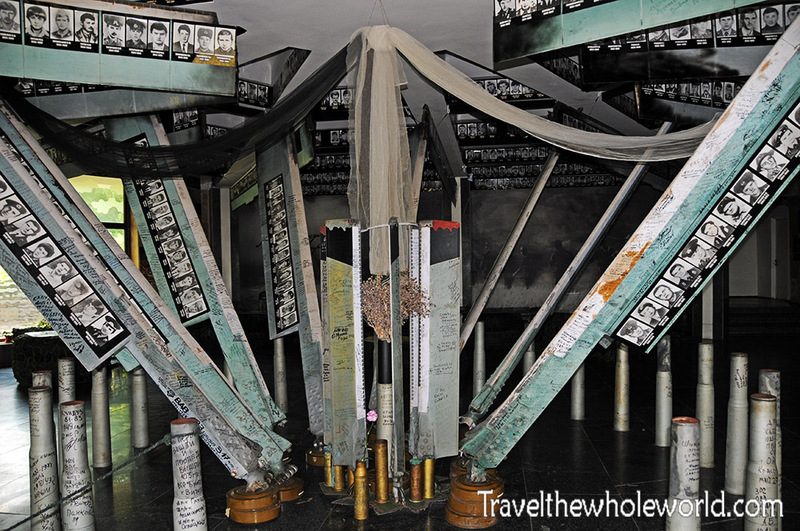 The Friendship of Nations monument, which has stood for over 35 years, doesn’t have much time life. As part of Ukraine’s decommunization program, the country made a formal announcement that the Friendship of Nations monument will be dismantled.